Enemy Among Us follows former FBI Special Agent Jim McLeary on a dangerous mission that tests his unconventional investigative skills and his determination to foster a new relationship with his estranged sons. Confronted by an adversarial female partner and an egocentric Section Chief with a hidden agenda, McLeary struggles to prevent an elusive enemy from releasing a silent weapon of mass destruction. Hindered by a tainted past, his quest for redemption in the eyes of his sons further complicates his operation and endangers the family he sets out to protect. In the end, he endures a gauntlet of double-agents, covert operatives, and a guilty conscience—before a deadly confrontation underscores his worst fears and reveals how the cost of victory may prove more than he can bear. 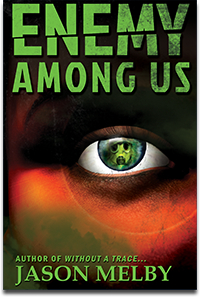 Enemy Among Us is available at Amazon, Barnes & Noble, Apple, and other major retailers.